I started this as an experiment. You see, it started with a paper plate. But the design my thawing blueberries made was pretty cool, and I was loathe to throw it away. Then I thought: Yowzas! I could sell this on eBay and pocket the cash - because if we've learned anything from Jay Leno, it's that people buy and sell really weird stuff on eBay. Okay. Here it is. My "organic postmodern art." I'm not kidding, I went that facetious. In for an ounce, in for a pound, or whatever. I know what you're thinking: I want that for my kitchen wall. But please, don't bid just yet. I want to see if it will actually sell, not if you, my loyal reader, will buy it. Would you like to know what the official description is? Okay. But stopping drinking or eating whatever you're drinking or eating. 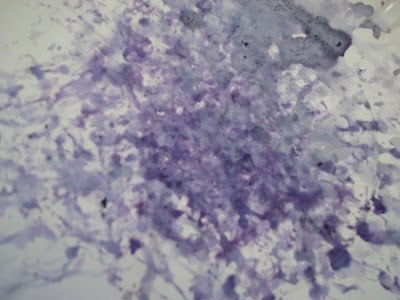 ~Unique abstract piece created with the stains of blueberry juice. 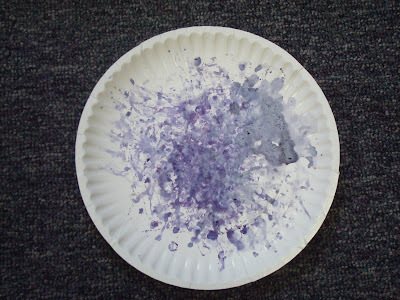 Streaks, blots and spatters capture the motion of frozen blueberries as they thawed. Sometimes I like to do things that are unpredictable. Hope you get a LOT of bids!